“The creative energy in Chelsea has always captivated and inspired me,” Elena Frampton says. 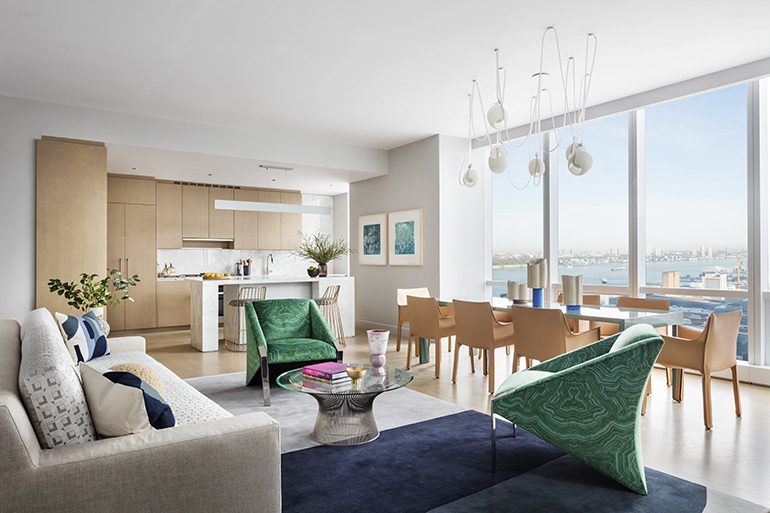 Though her eponymous firm Frampton Co has developed a signature blend of quirk and luxury in residences throughout New York City, it’s this model apartment for Diller Scofidio + Renfro and Rockwell's Group's 15 Hudson Yards high-rise on Chelsea’s north edge that might be its boldest work yet. A Rich Brilliant Willing chandelier illuminates the dining area’s Gamma dining table and saddle leather chairs by Mario Bellini. Photography by Scott Frances for Related Companies. 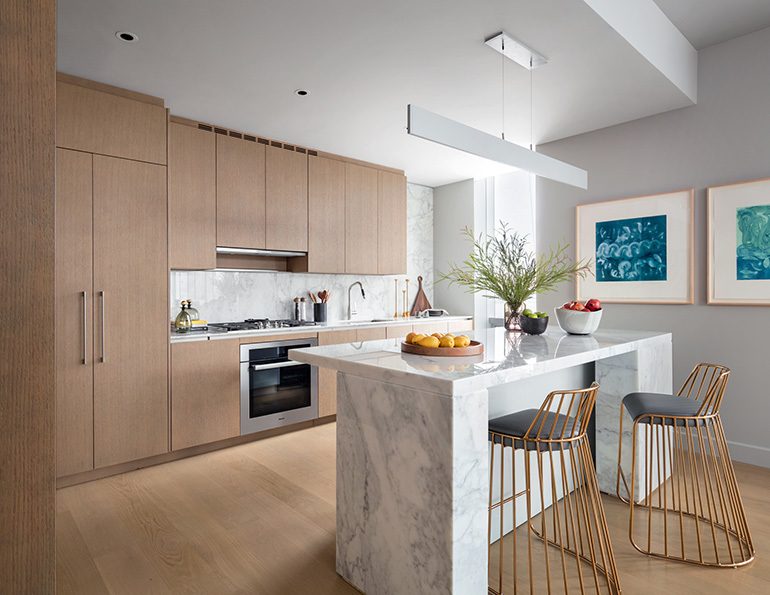 The 2,200 square feet embrace juxtaposition: in the living area, for example, she covered minimalist Milo Baughman lounge chairs with maximalist faux-malachite upholstery and placed them near a space-age floor lamp by Brazzoli & Lampa for Harvey Guzzini. “We used a high-contrast between colors, textures and art elements to create a fresh way to live,” she says. 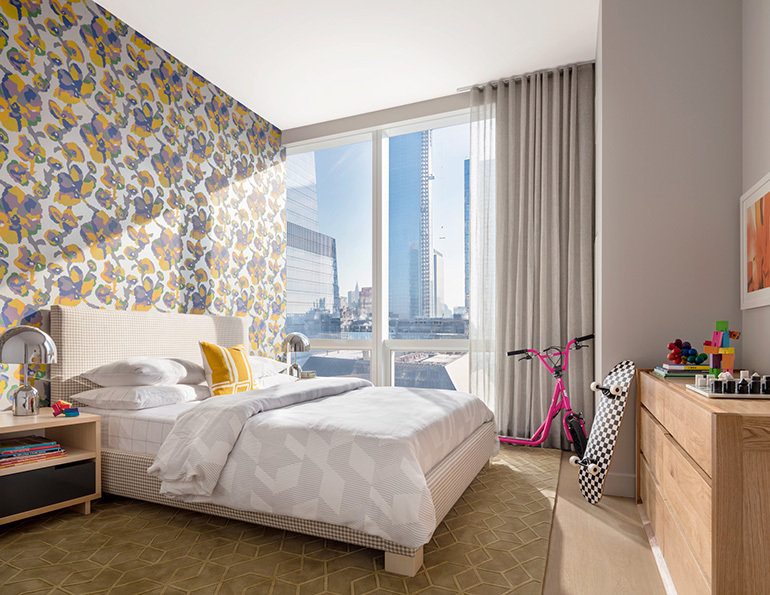 And because it’s Chelsea, art is a main focus, with pieces by Jonathan Smith and Irby Pace, mixed with eye-popping wall coverings, such as the study’s expanse of peacocks by Fardis, a work of art in itself. Dieter Rams’ Universal system defines the study, with a Sacco rug designed by Frampton, Restoration Hardware sofa, task and arm chair by CB2, and bench by Made Goods. Photography by Scott Frances for Related Companies. Karen J. Revis’ silk screens on paper brighten the kitchen, with Reza Feiz BV stools from Property. Photography by Scott Frances for Related Companies. 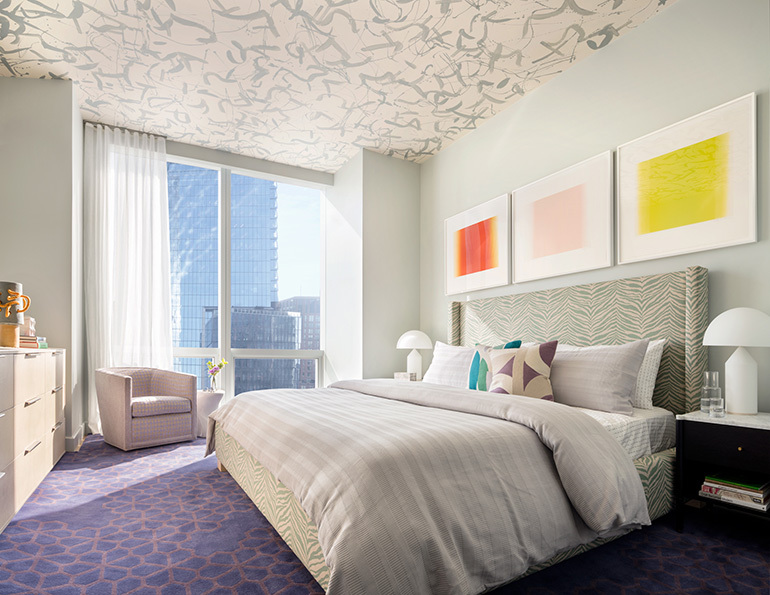 In the master bedroom, three monotypes by Betty Merken hang beneath a ceiling with custom wall covering by Porter Teleo; Vico Magistretti glass lamps on Egg Collective for DWR nightstands bookend the custom bed. Photography by Scott Frances for Related Companies. 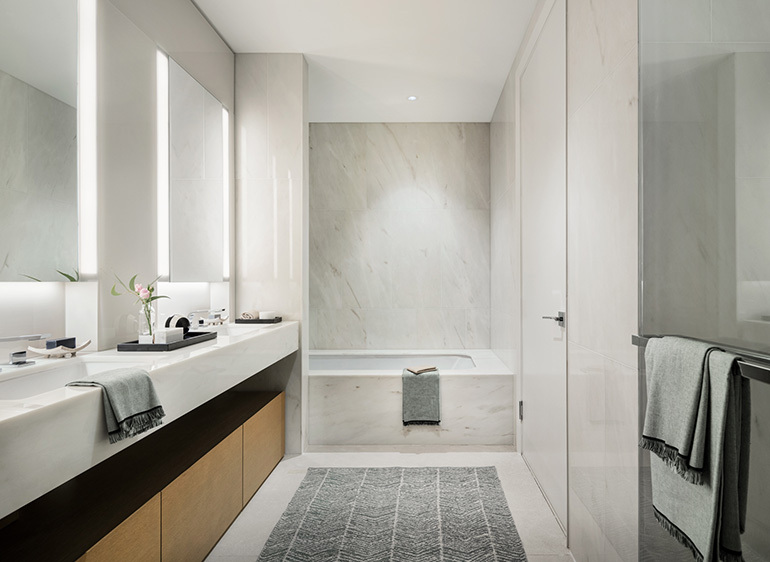 A rug from One Kings Lane gives direction to the marble-clad master bathroom. Photography by Scott Frances for Related Companies. A Casamance wall covering blooms behind a custom bed. Photography by Scott Frances for Related Companies.